Keeping New Zealand’s trees and forests healthy is vital if they are to thrive and be productive. Diseases, insect pests, and invasive weed species all threaten the health of our tree resource. FGR’s Forest Health research includes a range of programmes working on different aspects of protecting our plantations and enhancing national biosecurity. 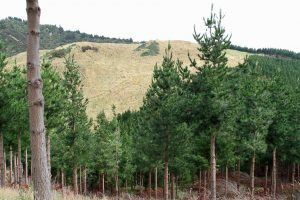 The Healthy Trees, Healthy Future and Needle Disease Strategy programmes aim to reduce the impact of needle diseases on radiata pine and other tree species. The Bioprotection programme takes a different approach, using a natural organism – endophytes – to increase plantation productivity and resilience. The Pest Control in Urban Areas research team are developing a suite of tools to help with pest surveillance and control in sensitive urban areas.